As somebody who grew up in Florida as a young child, this gave me a good laugh because I knew exactly what he was talking about. My family and I had spent countless hours at the Magic Kingdom…and I had boxes of pictures to prove it! My parents had given me an inexpensive 35 mm camera with which to capture our experiences. 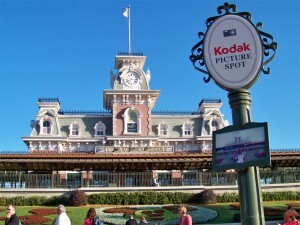 One of the dozens of “Kodak Picture Spot” signs that were once found throughout the Magic Kingdom. Of course, if we weren’t sure which memories we wanted to immortalize on film, the Disney folks (along with their sponsors from Kodak) seemed more than willing to help us out. Throughout the park, signs had been installed to help us find the perfect place to capture our “Magical Memories.” Of course, these signs usually meant that we had to wait in line, just so that we could take the same shot as dozens of other tourists. But at least when we got back home, I wouldn’t be the only kid in class who hadn’t gotten a picture in front of the teacups! But as I think back on our family vacation, I am at least experiencing nostalgia for some place that I have actually been. What truly amazes me is my ability to have a nostalgic memory of an event when I wasn’t even present there to begin with! Take the baptism of our Lord. When I picture this moment in Scripture, I usually see Jesus being dipped into the serene blue waters of the mighty Jordan river and emerging in shimmering light all while a dove descends in gorgeous slow motion and, from out of nowhere, triumphant horns proclaim a hymn of coronation. Years of viewing classic paintings and big screen theater depictions have left this indelible image in my mind. However, the reality is that the true setting for Jesus’ baptism was a far sight from the idyllic scenes that we hold in mind. When you see it as it truly is, one of the first things you might notice is that the Jordan River is not a large water feature. In fact, when looking at it, you might think that it would be more accurate to name it the Jordan Creek. For the most part, it is a shallow, narrow waterway, which takes little time to cross. Probably the only thing less impressive than the river’s size is the appearance of the water itself. 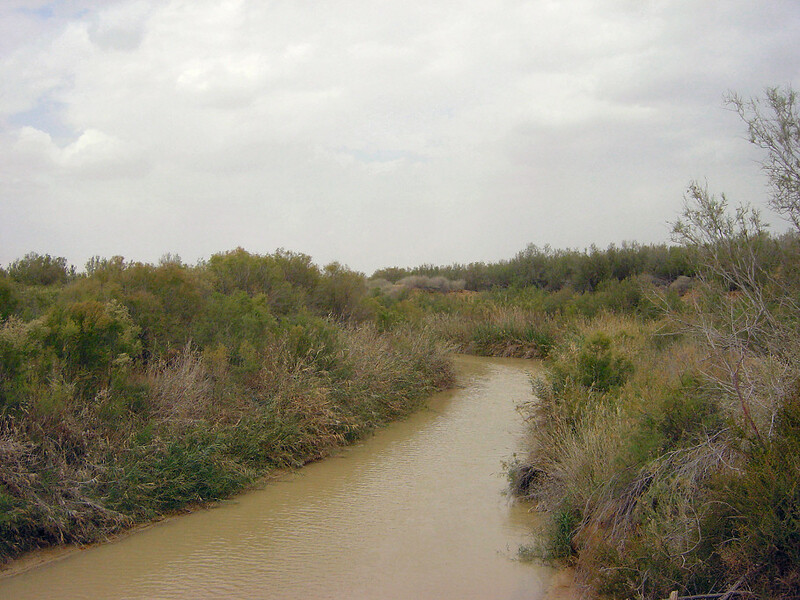 While we imagine an endless flow of crystal clear water, which reflects the bright blue skies overhead, the real Jordan’s waters appear a dingy brown that makes it look less like a baptismal pool and more like a drainage ditch. If these were the waters where people were coming to be made clean, you can just imagine how dirty with sin they must have felt. Of course, part of my false memory is the sight of our Lord Jesus confidently arising from the water in his bright white robe. But more likely, his clothes might have actually been stained with the sediment of the river. Shivering from his dip in the cold, murky water, Jesus probably couldn’t wait to get out of the Jordan…to move on from this place. But if nostalgia has left us with a false sense of serenity at our Lord’s baptism, our minds make no effort to improve the next scene in our Gospel tale. The Spirit that only moments ago had softly descended upon our Lord now drives him out into the wilderness. While the River had its drawbacks, at least it was a communal place. But now, Jesus finds himself in a place of absence. Here, there is no food, there is no water, not even a muddy puddle the likes of the Jordan. Here, there is nobody else to keep him company. Well, almost nobody else. While we might be hard pressed to think that there is a right place and a right time to encounter Satan, we can certainly say that this isn’t it. For forty days and forty nights, Jesus’ experience in the wilderness allows him to embody the experience of Noah in the ark and of the Israelites wandering for forty years before entering the Promised Land. As he relies on the angels of his Father to provide for his sustenance, Jesus is tempted by Satan to reject God. But Jesus remains faithful. And at the end of his fast, he is prepared to begin a ministry that will lead him to the cross and the tomb. Every year as we enter into Lent, it seems like we see everyone lining up to create the same memories of penitence. Everyone is pledging to give up chocolate, or television, or Facebook. On Ash Wednesday, we piously share pictures of the gray cross that is marked on our foreheads as though it is a sign of honor. We do all the things that signal to the rest of the world that now is the right time and this is the right place for us to come to God with penitent hearts. And God does indeed welcome us to turn back to the ways of the Lord. But as we make this turn, God wants us to know something very important. Despite the way we might remember things, God is always with us. When we look back to discover that so much of our nostalgia masks the grimmer truth of our past, one thing holds true. God was there. When we look at our present walk through this time of repentance, God is here. And as we look ahead to the ministry that awaits us, as we too approach the cross and the tomb, we must go forward to proclaim the Good News, carrying with us the assurance that God will be here. Friends, throughout our own Lenten journeys, I encourage each of us to recognize that this is the right place and the right time to turn to God. In the midst of the joys in our lives, as we celebrate a successful day at work, a good grade on that school project, or a joyful family event, may we turn to God and give thanks. As we are faced with health setbacks, financial struggles, peer pressure, and family dysfunction, may we turn to God and seek guidance. And as we experience all of the other moments along the way, may we turn to God who is ever with us. Wherever we go in these forty days, may we know that there is nowhere that we are cut off from God. For by the covenant of grace, established through our Lord Jesus, God is with us in every time and place. In the name of the Lord Jesus Christ we bend our knees and lift up our hearts, giving glory to God forever. Amen. This sermon was delivered at Bowling Green Presbyterian Church on Sunday, February 22, 2015 (The First Sunday in Lent). This entry was posted in Sermons and tagged Baptism, covenant, Repentance. Bookmark the permalink.